H. David Humes, MD with the first human application of the bioartificial kidney. This device is not yet available for standard use. No volunteers are needed at this time. 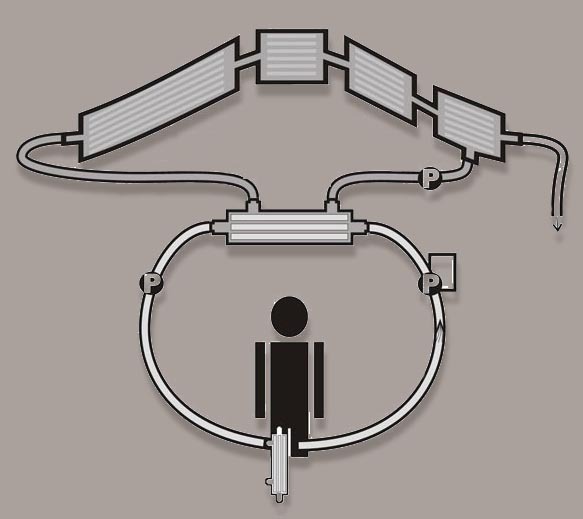 The "bioartificial kidney" developed by the laboratory of H. David Humes, MD is a two part device consisting of a blood circuit in which a commercial hemofilter is followed by a novel "Renal Assist Device" (RAD) containing living human cells. The incorporation of living cells adds benefits unattainable by inanimate technology alone. The bioartificial kidney has been used to treat patients suffering acute renal failure and the results are promising (see Clinical Trial). 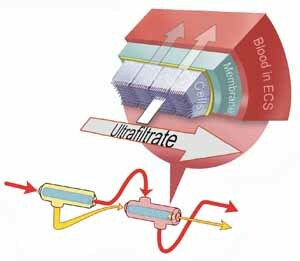 Top: In hemofiltration, blood is passed through a cleansing membrane before being returned to the patient. The "ultrafiltrate" waste (yellow) is discarded. 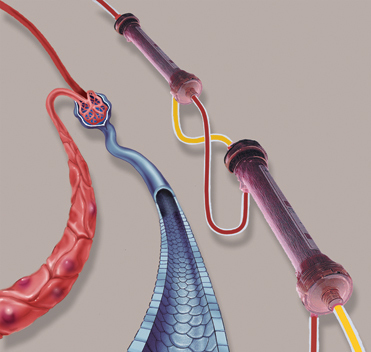 Left: A two part nephron, the functional unit of a natural kidney. The natural kidney accomplishes its work in two steps: First, small molecules are filtered from the blood. Next, living cells actively reclaim valuable salt, electrolytes, glucose and water. Right: A two part bioartificial kidney replicates the two part function of the natural kidney: fltration of toxins followed by reabsorbtion. Additionally, living cells themselves produce and return to the blood substances necessary for health. Furthermore, living cells influence the regulation of immune system molecules called cytokines, which play an important role in infection-fighting inflammation. When uncontrolled, inflammation can cause significant health problems. 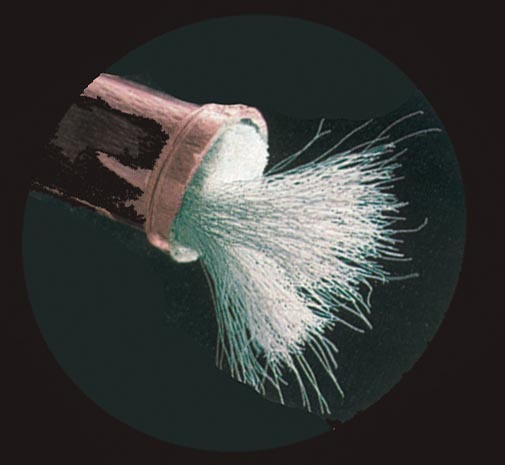 Hollow fibers of the second, RAD, cartridge are lined with living, human renal proximal tubule cells. The device thereby mimics the two part function of the natural kidney: fltration of toxins followed by reclamation of salt, electrolytes, glucose and water, plus the metabolic activity that only living cells can provide. Our ability to produce these devices is significantly improved by securing a reliable source for the living cells, through technology we have developed and call BRECS. 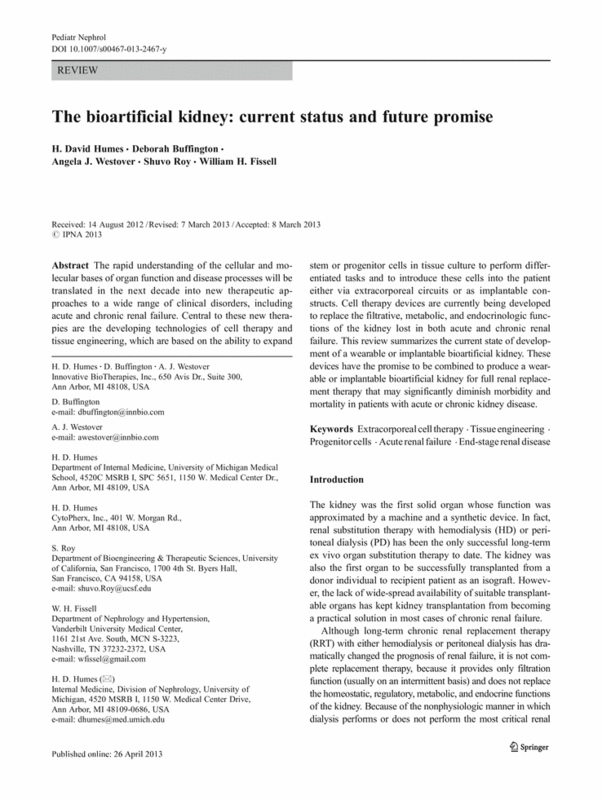 After results of pre-clinical tests (described in Nature Biotechnology and Science) showed promise, the FDA approved a phase I clinical trial of the bioartificial kidney for treating desperately ill patients already in the ICU and receiving Continuous Venovenous Hemofiltration (CVVH) for acute renal failure along with other life-threatening conditions (such as sepsis, multiple organ failure, and acute respiratory distress syndrome). Normally, phase I trials test only to make sure the experimental device does no harm and is safe for further study. But since there were no normal control subjects-- you wouldn't put a healthy person on CVVH-- we garnered early efficacy data, as well. Due to slow patient enrollment related to strict enrollment criteria (test patients were in acute renal failure and multiorgan failure) and need to assess the manufacturing program. Interim analysis of collected data conducted by an independent monitoring committee led to a corporate decision to discontinue enrollment in this study and proceed to the design of a confirmatory study. Meanwhile, data from the trial gave rise to a new, promising avenues of inquiry which has led our lab to develop other new treatments for kidney failure, particularly disorders of the inflammatory response related to kidney failure. The approach is also promising for treating other conditions caused, exacerbated and/or characterized by unwanted inflammation. The cytophoretic device link has details. The bioartificial kidney used in the acute renal failure (ARF) clinical trials further demonstrated promise for treating end stage renal disease (ESRD) by supplementing conventional small solute clearance (hemodialysis or hemofiltration) with the endocrine and metabolic function provided by living cells. We are currently working to miniaturize the RAD component of the bioartficial kidney and to combine it with sorbent dialysis (a technology for regenerating dialysate fluid using peritoneal fluid). Together with our BRECS cell therapy system to create a wearable, continuous-acting, long term bioartificial kidney for treating Chronic Renal Failure. Pre-clinical results paved the way for human trials.